Whether you love them or hate them, the Bourne movies represent the dramatic gritty realism of the action genre (compared the heavy usage of CGI) and the cinematic “gray” handling of international espionage. Deriving from the works of author Robert Ludlum, the films (in a nutshell) follow the character of Jason Bourne, a rogue CIA assassin who suffers from memory loss who must try figure out who he is and his uncover his shady past. Beginning back in 2002 with The Bourne Identity, the franchise grew popularity and with actor Matt Damon as the central character (Jason Bourne). From there, The Bourne franchise continued with 2004’s The Bourne Supremacy and somewhat concluded a set theatrical trilogy with 2007’s The Bourne Ultimatum. In 2012, a spin-off fourth film was released, titled The Bourne Legacy, which featured a new character (Aaron Cross), but set in the same universe as the previous films. Unfortunately, this movie was problematic and wasn’t well received as past installments from both critics and moviegoers. Seeking redemption from Legacy’s failed attempt, Universal Pictures and director Paul Greengrass sees the return of Matt Damon’s Jason Bourne in the self-titled movie Jason Bourne. Is the world ready for another Bourne movie? CIA Director Robert Dewey (Tommy Lee Jones) is preparing to make a pact with tech industry and tycoon mogul Aaroon Kalloor (Riz Ahmed) on a project that would allow the government an unlimited free range to spy on its citizens. Aiding him in this endeavor, Dewey’s subordinate Heather Lee (Alicia Vikander) protect his interest, trying to make her own mark on the agency as part of the “next” generation of the CIA. After uncovering Dewey’s plan, Nicky Parsons (Juliet Stiles), a former operative in the Treadstone program, is on the run and seeks out her old contact. Emerging from the shadows is Jason Bourne (Matt Damon), who’s now a shell of the man, learning about his father’s involvement in the Treadstone operation as old memories from Bourne’s past resurface. Evading capture from CIA operatives and being pursued by the rival assassin Asset (Vincent Cassel), Bourne undergoes a global trail, uncovering the mystery behind his father and to Dewey’s ultimate endgame. I’ll start by saying that I’m fan of the Bourne movies Well, to be more exact, I’m a fan of the Jason Bourne movies (Identity, Supremacy, and Ultimatum). I thought that Identity was good, but just okay. It wasn’t until Supremacy came along that I actually got enthralled with the series, further establishing the character of Jason Bourne and the espionage world that has ensnared him. Three years later, Ultimatum was released and somewhat concluded the story that began in Identity, bringing a fitting end to Bourne’s tale and resolving many of its narrative threads. With the success of the franchise, many fans (including myself) wanted to see the series to continue, spinning a new yarn to the tale. What we got was somewhat different. Like many out there, I did not like The Bourne Legacy. I do like Jeremy Renner as an actor and do applaud the film’s director (Tony Gilroy) and his crew for creating a somewhat interesting spin-off in the Bourne universe, but it just wasn’t the same as the past Bourne movies. Now finally, after almost nine years since the conclusion of The Bourne Ultimatum, we get a new Bourne movie (Jason Bourne) with Matt Damon returning to the project as the iconic character. I was super excited to see this movie (I’ve watched the trailer many times) and eager awaited to see what the film had to offer. After seeing it, I felt that, while an entertaining action / spy flick continuation and solid performance from Matt Damon, Jason Bourne plays its safe and follows the formula of past Bourne adventures. Director Paul Greengrass, who previously directed two other Bourne films (Supremacy and Ultimatum) returns to the series to helm Jason Bourne. Given that he has prior knowledge of the series, Greengrass jumps right into the foray, crafting a feature that (for the most part) sees the return to the roots of the Bourne series. What do I mean by that? Well, everything that you love in the past Bourne movies (Damon’s Bourne) comes back in full force. We’re taking about action, chases, close-quarter brawl fisticuffs (the scene where Bourne clocks a guy in one hit is the best). The intensity level of movie is also heightened with quick shot edits and the whole “shaky cam” aspect (some might not like it, but I personally think it fits with grittier action scenes). Even the music, composed by David Buckley and John Powell, adds the necessary intension and overall suspenseful ambiance. In addition, the movie’s story adds an interesting tale of cyber-security to the public, which brings the Bourne franchise to the modern age of personal privacy vs. governmental involvement. So, despite some bad things that I’m going to say about the movie in the paragraph below, Jason Bourne, through its intense action scenes and series’ fundamentals / nuances, excels in what makes it a Bourne movie and sustains an entertain level from onset to conclusion. Where that “entertain” level is will depend on the viewer, however. The problem with Jason Bourne is that it has what I call “The Bourne Familiarity”. What I mean is this…the movie derives most of its narratives and plot beats from Bourne films past. When Ultimatum ended, the Bourne franchise was left to go anywhere, further evolving the character of Jason Bourne into his next stage of whatever they came up with. Without going into completely details about it, the movie Jason Bourne basically follows the storyline path from Supremacy, so much so that many of the important beats and story twists are very familiar and are tad predictable. Perhaps after the disappointment of Legacy (the black sheep of the Bourne series) that the studio Execs and director Paul Greengrass wanted to play it safe, crafting a story for Jason Bourne in a similar way that it would play to strengths (from its past) and won’t “upset” the apple cart of its viewers. Even the unexplored fragment of Jason Bourne’s past that film examines is more of a subplot to the narrative and comes of a little bit clunky and doesn’t really “resonate” as strong as past revelations had did in past chapters. To simply put it, Jason Bourne lacks an overall freshness and innovation for the franchise, feeling like clone (albeit a good and entertain one) that bring that much of anything new to the Bourne cinematic table. Of course, the real excitement for Jason Bourne is that the movie sees the return of its main principal character, played by acclaimed “A-lister” actor Matt Damon. Like a lot of actors who have created a character through multiple feature films (i.e. Johnny Depp with Jack Sparrow, Robert Downey Jr. with Tony Stark, Vin Diesel with Dominic Toretto, etc. ), Damon truly does embody the character of Jason Bourne. Having stepped away from the roles for almost a decade, Damon easily slides back into the persona, never missing a beat whether it’s his dialogue scenes (still a very minimalistic approach) or action-stunt brawls / sequences, or able to comminute Bourne’s emotions and thoughts through facial expressions and body mannerisms. In short, though both Matt Damon and Jason Bourne are looking a little gray around the temples, both are still effective as both actor and character. Damon is Bourne and Bourne is Damon. Plain and simple. Veteran, seasoned, and Oscar-winner actor Tommy Lee Jones plays the shady CIA Director Robert Dewey. While Jones’s acting ability is great, the character itself it’s something new or original to the franchise, portraying the high up “puppet master” from Bourne films past (Chris Cooper’s Conklin, Brian Cox’s War Abott, and David Strathairn’s Noah Vosen). Alongside Jones is recent Oscar-winner and up-and-coming actress Alicia Vikander, known for her roles in such hits as Ex-Machine and The Danish Girl, who plays Heather Lee, a promising new recruit in the CIA. Like Jones’s Dewey, Vikander’s Lee shares a similar façade in Jason Bourne to a past character (Joan Allen’s Pamela Landy from Supremacy and Ultimatum). However, unlike Dewey, the character of Lee’s true agenda is slightly ambiguous and will (presumably) be fleshed out more in future installments, making her character much more interesting of the two. Also, Vikander’s performance of Lee is great (i.e. subtle and sharp). Other than Damon’s Jason Bourne, the only other returning character to from past installments is Julia Stiles as the former Treadstone handler Nicky Parsons. Stiles’s performance is fine (bringing some continuity to the current movie) but, other than dropping hints about what she’s been up since Ultimatum, Jason Bourne doesn’t really give her the platform to develop her character beyond the customary setting of aiding Bourne and advancing the plot forward. In a similar fashion, Vincent Cassel’s character of the nameless “Asset” tracks and pursues Bourne throughout the movie’s narrative. While he does have a bit of a backstory (i.e. understanding his motivations for going after Bourne), the “Asset” role is similar to what has come before from previous installments (Clive Owens, Karl Urban, Edgar Ramirez), making the character, as a whole, a bit predictable. Damon’s Bourne is back, seeking more answers to his past in the new movie Jason Bourne. 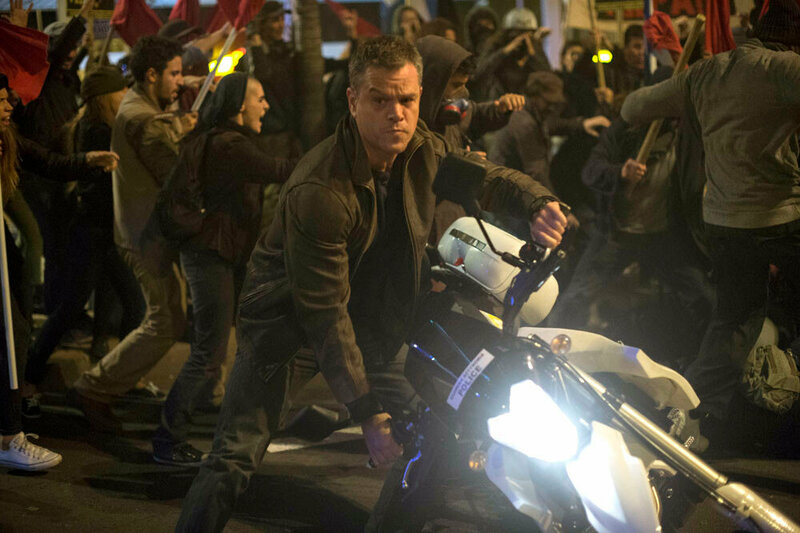 Director Paul Greengrass’s feature (the fifth installment in the franchise) sees the return to the roots of the series (in almost all aspects) as well as its chief main protagonist in actor Matt Damon. However, the film can’t escape from drawing similar ideas and repetitive beats from the past, causing a “been there, done that” motif throughout. As I said, I loved Damon’s Bourne movies, so I did like Jason Bourne. However, it’s kind of hard to ignore the familiar plot beats and narrative structure from previous installments. Thus, I have a love / hate viewing relationship with this film. Still, I do recommend the movie for fans of the Bourne series (it definitely is better than The Bourne Legacy) and to those who like action movies. On the other hand, it’s an “iffy choice” as well as some who wanted something “new” to the Bourne series will be slightly disappointed. Here’s to hoping that the Bourne franchise continues forward, but offers more innovation to the on-going narrative to Jason Bourne rather than a “Treadstone” retread of past features. The Bourne Familiarity might have been a more apt title! I agree with much of what you say…if The Bourne Legacy was like a tribute album then this film is a greatest hits, of sorts, and it’s just full of material followers of the series will know too well. That said, as a fan of the previous films I got what I wanted in terms of the action, and left the cinema happy enough. Thanks for the comment. Yeah, I agree. It wasn’t anything completely new or refreshing to the series, but it was still a fun and entertaining feature.